Model: T4500E. 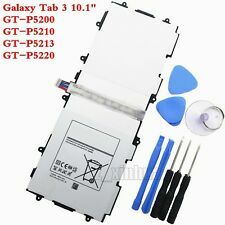 Fit For SAMSUNG GALAXY Tab 3 10.1" GT-P5210 GT-P5200 GT-P5220. We stand behind our quality products. We will respond within 24 hours (Sun. excluded). Samsung Galaxy Tab 3 7.0 -. Battery life not what it used to be?. Install a this new battery and breathe new life into your Tablet. • Li-ion Battery Original. (Photo above is actual part). Extra Information. Samsung Galaxy Tab Pro 8.4 -. Battery life not what it used to be?. Install a this new battery and breathe new life into your Tablet. • Li-ion Battery Original. Extra Information. Fit For Samsung Galaxy Tab A 8" SM-T350 SM-T355 SM-T355C SM-T357W. 100% NEW OEM Battery model No:EB-BT355ABE EB-BT355ABA. ￭ Fit for:Samsung Galaxy Tab 4 10.1" T530 Series. ￭ Status: New Working Battery. ￭ Warranty: 12 Month. Samsung Galaxy Tab 4 10.1 -. Battery life not what it used to be?. Install a this new battery and breathe new life into your Tablet. • Li-ion Battery Original. • 100% NEW, TESTED, and NEVER USED. Extra Information. Samsung Galaxy Tab S 10.5 T800, T801, T805, T807, T807A, T807P. ￭ Fit for:Samsung Galaxy Tab S 10.5 SM-T800, SM-T801, SM-T805, SM-T807, SM-T807A, SM-T807P. ￭ Status: 100% NEW BATTERY. ￭ Warranty: 12 Month. For Sale SAMSUNG GALAXY TAB S2 9.7" EB-BT810ABA SM-T817 SM-T815N0 SM-T817W SM-T817P SM-T817T BATTERY. Samsung Galaxy Tab S2 9.7". 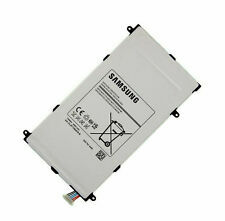 Samsung EB-BT810ABA Battery for Galaxy. SM-T817 SM-T815N0 SM-T817W SM-T817P SM-T817T EB-BT810ABA BATTERY. ￭ Fit for: Samsung Galaxy Tab A 8" SM-T350 T355C Tab5 P350. ￭ Status: 100% OEM NEW BATTERY. ￭ Model: T8220E, T8220U. ￭ Fit for:Samsung Galaxy Tab Pro 10.1" SM-T520 SM-T525. Samsung Galaxy Note 10.1" SM-P600, SM-P605, SM-607T. ￭ Status: 100% NEW BATTERY. ￭ Warranty: 12 Month. Samsung Galaxy Tab 2 10.1 GT-P5100 P5110 P5113. Samsung Galaxy Tab 10.1 P7500. ￭ Fit for:Samsung Galaxy Note 10.1 GT-N8000 N8010 N8020 (doesn't fit for 2014 Edition SM-P600 Series). ￭ Status: 100% NEW BATTERY. Samsung Galaxy Tab A 8" SM-T350 T355 T357. Capacity: 4200mAh. 1 x Battery. Samsung Galaxy Tab 4 7.0 -. Battery life not what it used to be?. Install a this new battery and breathe new life into your Tablet. • Li-ion Battery Original. Extra Information. ￭ Fit for:Samsung Galaxy Tab Pro 8.4" SM-T320 SM-T321 SM-T325 SM-T327. ￭ Status: 100% OEM NEW BATTERY. Samsung Galaxy Tab 3 8.0 -. Battery life not what it used to be?. Install a this new battery and breathe new life into your Tablet. • Li-ion Battery Original. (Photo above is actual part). Extra Information. Fit for: Samsung Galaxy Tab 4 10.1" SM-T530 T531 T535 T530NU. We stand behind our quality products. If we cannot find your item. We do not want to give you a bad buying experience. We will respond within 24 hours (Sun. ). SAMSUNG GALAXY TAB E 9.6 SM-T560NU SM-T561Y SM-T561M. Exactly work as genuine parts. Samsung GT-N8000 Galaxy Note 10.1 / Galaxy Note 800. Samsung GT-P7500 Galaxy Tab 10.1. Samsung GT-P7510 Galaxy Tab 10.1 Wi-Fi. Samsung GT-P5100 Galaxy Tab 2 10.1. Samsung GT-N8010 Galaxy Note 10.1 WiFi / GT-N8013. Product Type: Battery Condition: 100% Brand New BATTERY and 100% Working and 100% Tested Model: EB-BT355ABE Voltage:3.8V Charge Voltage:4.35V Capacity:4200mAh=15.96Wh Compatible Models: For Samsung Galaxy Tab A 8" SM-T350 T355C Tab5 P350 Warranty: 12 Month Quality: High Quality and stable performance, Each goods is tested before shipping and are in good working Shippment: The same day shippment,dispatch your purchase within 1 business day after payment is completed. New bulk packaged, no retail packaging Package Include: . Capacity: 4000mAh. Samsung Galaxy Tab 4 7.0 SM-T230 SM-T230R SM-T230NU. Exactly work as genuine parts. Samsung Galaxy Tab 3 7.0 SM-T217S T217A T217T T217. Exactly work as genuine parts. 1 x Battery. ▶ Replace Part Numbers. Fit for: Samsung Galaxy Tab 3 8.0 SM-T310 T3110 T315 T311. Cell Qty:1. Cell material: Li-ion. 100% NEW OEM one. GALAXY Tab A 8.0 T355C T350 Tab5 P350 P355C. OEM product, perfect fit without modification. Trending at $13.99eBay determines this price through a machine learned model of the product's sale prices within the last 90 days. New 6800mAh EB-BT530FBC Battery For Samsung Galaxy Tab 4 10.1" SM-T530 SM-T530NU. Capacity: 6800mAh / 25.84Wh. Samsung Galaxy Tab 4 10.1 T530. Samsung Galaxy Tab 4 10.1" SM-T530. Samsung Galaxy Tab 4 10.1" SM-T530NU. Samsung Galaxy Tab 10.1 P7500. Samsung Galaxy Tab 2 10.1 GT-P5100 P5110 P5113. ￭ Fit for:Samsung Galaxy Note 10.1 GT-N8000 N8010 N8013 N8020 (doesn't fit for 2014 Edition SM-P600 Series). ￭ Status: NEW BATTERY. ￭ Fit for:SAMSUNG TAB 3 7.0 SM-T210R CE0168. ￭ Status: 100% OEM NEW BATTERY. Samsung Galaxy Tab 2 10.1 -. Battery life not what it used to be?. Install a this new battery and breathe new life into your Tablet. • Li-ion Battery Original. • 100% NEW, TESTED, and NEVER USED. Extra Information. Capacity: 6800mAh. Samsung Galaxy Tab 4 10.1" SM-T530 SM-T530NU. Product Model: T4000E. Samsung Galaxy Tab T211. Samsung Galaxy Tab T210. Battery Type: Li-ion. Battery capacity: 4000mAH. Battery Country of Origin: China. Battery Type: 3.7V Li-Ion. We are always here ready for help. Fit For SAMSUNG TAB 3 7.0" SM-T210 T211 T215 P3200. Cell material: Li-ion. If we cannot find your item. We do not want to give you a bad buying experience. We stand behind our quality products. It will not reflective to the total price you paid or the market value of the product. Capacity: 5870mAh / 22.60Wh. Samsung Galaxy Tab S2 9.7 SM-T819Y SM-T819C SM-T813 SM-T817P. Samsung Galaxy Tab P3100 | P3110 | P3113 | P6200 | Samsung Galaxy Tab 7. 1 x Samsung Galaxy Tab Battery. We are always here ready for help. What you get Sorry, no local pick up. Samsung Galaxy Tab 4 8.0 T330 T331 T335Samsung Galaxy Tab 4 8.0 8" SM-T330 SM-T330NU T331 T335 T337 SM-T337T T337A SM-T33. Compatible Product Line For Samsung Galaxy Tab 4. Compatible Model For Samsung Galaxy Tab 4. Capacity: 4000mAh / 15.4Wh. Samsung Galaxy Tab S2 8.0" SM-T713 SM-T719 SM-T719C. 1 x Battery. ￭ Compatible Model: T4500E. ￭ Fit for: Samsung Galaxy Tab 3 10.1 GT-P5200 GT-P5210 GT-P5220 GT-P5213. ￭ Status: 100% NEW BATTERY. ￭ Warranty: 12 Month. Compatible model:GT-P7500 Galaxy Tab 10.1. GT-P7510 Galaxy Tab 10.1. SGH-T859 Galaxy Tab 10.1. GT-P5100 Galaxy Tab 2 10.1. GT-P5110 Galaxy Tab 2 10.1. GT-P5113 Galaxy Tab 2 10.1. SGH-T779 Galaxy Tab 2 10.1. Samsung Galaxy Tab A 10.1 2016 TD-LTE SM-T580NZKAXAR. 1 x Battery. SKU#: PB SAM 50. Samsung Galaxy Tab A 8.0（T355C）. Samsung Galaxy Tab 5, SM-T355C（T350）. Samsung Galaxy Tab 3 7.0 SM-T217 Samsung Galaxy Tab 3 7.0 SM-T217 Samsung Galaxy Tab 3 7.0 SM-T217. For Samsung Galaxy TAB A 8" SM-T350 SM-T355 Tablet. (Samsung Galaxy Tab 3 7.0 SM-T217 Samsung Galaxy Tab 3 7.0 SM-T217 Samsung Galaxy Tab 3 7.0 SM-T217. For Samsung Galaxy Tablet 4 7.0" SM-T230 SM-T235. Battery Capacity: 4000mAh. excluded). Compatible Models. 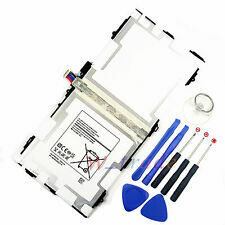 Tablet Pc 20T4000E Battery For Samsung Galaxy Tab 3 7.0 SM-T210R T217 T2105 Tool. Samsung Galaxy TAB 3 7.0 SM-T210 T211 P3200. ￭ Fit for Model: T4000E. Sorry, no local pick up. NEW OEM Battery Compatible Model: T4800E. Fit For Samsung Galaxy Tab Pro 8.4" SM-T320 SM-T321 SM-T325 T327. Samsung Galaxy Tab Note Pro 12.2" SM-T900 P905. Capacity: 9500mAh. We will work on resolving your particular case ASAP. Free Shipping !! US Seller !! Top Quality !! SAMSUNG - T4000E. GALAXY TAB 3 7.0 SM-T210 T211 T215. 1 x SAMSUNG BATTERY. - Samsung Safety Certified. Trending at $9.89eBay determines this price through a machine learned model of the product's sale prices within the last 90 days. Specification Battery Type: Li-ion Battery capacity: 4000mAH Voltage: 3.7V Warranty: 6 months Battery Country of Origin: China Compatible With Model Battery Type: 3.7V Li-Ion Rechargeable Battery Capacity: 4000mAh Product Model: T4000E Samsung Galaxy Tab T210 Samsung Galaxy Tab T211. SAMSUNG GALAXY TAB 4 7.0 SM-T230 SM-T235. Battery Type. Battery Capacity. Battery Condition. Replace Part Number. The Galaxy Tab is Samsung's line of tablets that run on the Android operating system. These portable devices use batteries to function away from power sources when you need to use them while traveling. 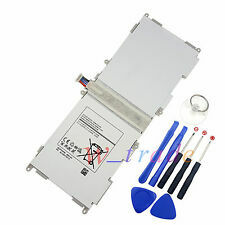 You can find affordable Galaxy Tab battery replacement options and tools on eBay. 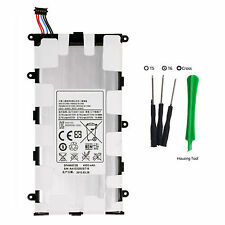 Can you get a Galaxy Tab battery for different models? The Galaxy Tab line of tablets includes several models that are battery-powered. You can find a selection of batteries that work with different Samsung Galaxy Tabs on eBay. 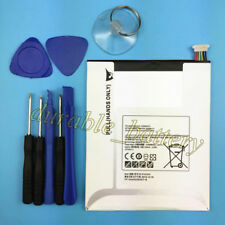 If you would like to ensure the compatibility of a Galaxy Tab battery with the model you use, you can find the name of your Galaxy Tab in eBay's list and select it. This list can help you narrow your search and find batteries that are designed to work with your Galaxy Tab. Note that some batteries may be compatible with multiple versions of the tablet. Some common models that you'll find batteries for on eBay are the Tab 2, 3, 4, and Pro. 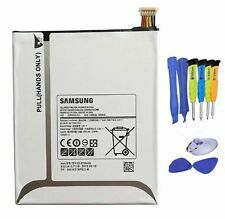 Can you get different Galaxy Tab battery packs? Screwdrivers - These tools can deal with the tiny screws that hold your Galaxy Tab together. Spudgers - Spudgers can help you deal with the adhesive that is in between the layers of your Galaxy Tab's frame. Suction cups - These cups can hold the layers of the tablet apart. 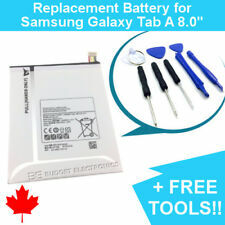 What are some features of the Galaxy Tab battery? High-capacity - Most lithium-ion batteries can take on a lot of energy and keep your Galaxy Tab powered for several hours. The amount of time that you can power your device on a single charge varies depending on the apps you are running. Slow discharge - The li-ion Galaxy Tab battery doesn't discharge much power when you're not using it. Charge memory - Most of these batteries will keep their charge memories and continue to charge to their full capacity each time. Content provided for informational purposes only. eBay is not affiliated with or endorsed by Samsung.